For her work leading public media’s American Graduate initiative to help countless youth succeed, CPB President and CEO Patricia de Stacy Harrison received a 2016 Promise of America Award from America’s Promise Alliance. 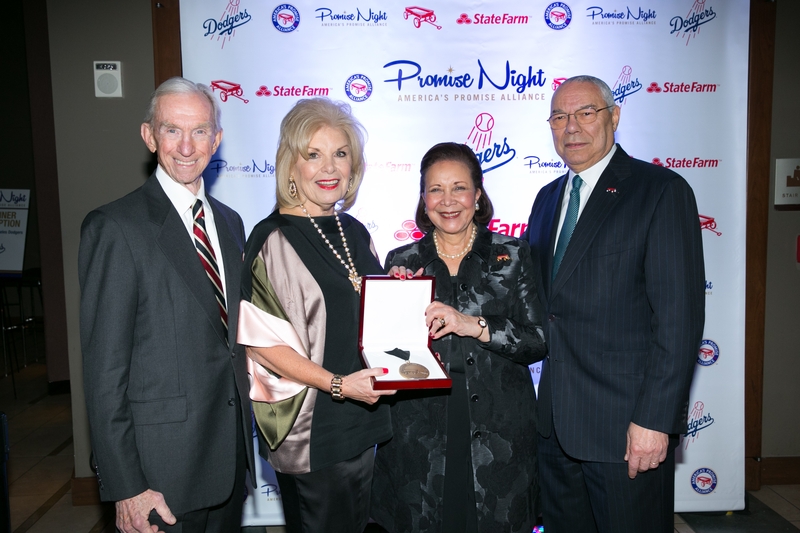 General Colin L. Powell, founding chair of America’s Promise, and Mrs. Alma J. Powell, current board chair, presented the award to Harrison at the Promise Night gala April 20 in Washington, D.C.
Harrison was recognized along with Brian Cornell, chairman and CEO of Target Corporation; Dr. Angela Diaz, director of the Mount Sinai Adolescent Health Center; and Earvin “Magic” Johnson, chairman and CEO of Magic Johnson Enterprises. The gala presentation included a video tribute to Harrison featuring her granddaughter, Skylar Spain. In 2011, CPB launched American Graduate with 25 public media stations in high-need communities to spotlight the high school dropout crisis. Today, more than 128 public radio and television stations in nearly every state have taken part in American Graduate and formed partnerships with government, business, faith-based and youth-serving organizations to put faces to the dropout statistics and to help communities work together to find solutions.